When a moment arises and there is an opportunity for dyeing, I dye, my friends, I dye. 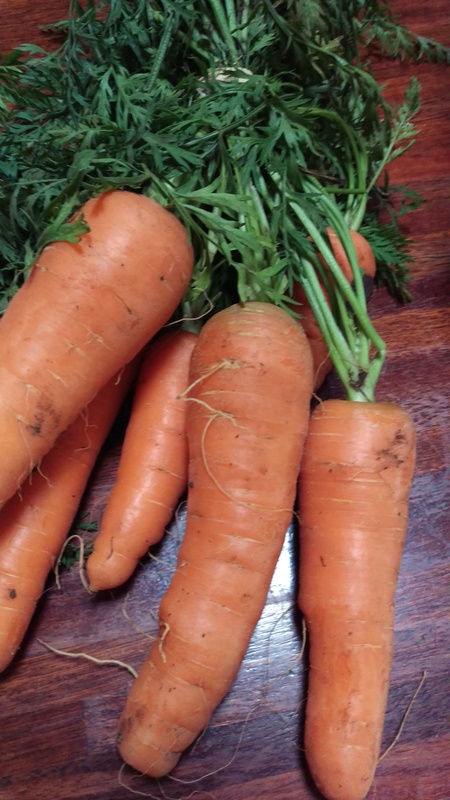 One such moment came a little while back when we had lovely organic carrots from our friends’ farm… and they came with lovely organic carrot tops, of course. Fixing carrot top dye requires alum, but I am well prepared. I have sheep fleece sitting in cold alum solution in buckets in my driveway. Into the dye pot they went! This went so well that I am doing it again as I write. Funny, I was thinking about carrot tops yesterday and wondering what the result would be. The grey base adds a lovely depth of colour and the result is absolutely gorgeous. I’m looking forward to more posts about your carrot top dyeing. By the way, do you think the tops of purple carrots would be a similar colour? I guess the colour is only in the roots ie carrots? I have found that orange carrots give a dependable yellow. I haven’t tried dyeing with purple carrot tops so far as I remember! I wouldn’t be prepared to commit to an answer on them without trying them out 🙂 Thanks for your lovely compliment. I don’t know about dyeing with the purple carrot tops…… But, very thin slices of purple carrots, when doing contact printing, gives nice blue circles! I had no idea that carrot tops would give such a wonderful colour. I will try them ASAP. Do you know how long you can leave fabric sitting in an alum bath. I’ve left it for 4 days but am always worried it is damaging the textile in some way. I’ve been dyeing with acorns and a little rust this week for a lovely deep brown. Thanks again for another inspiring post! I have seen acorn and iron dyeing but not tried it. I have had wool steeping in alum for months and nothing bad has happened! Happy dyeing…. That is a fabulous colour!! Nice job as usual. Delicious! Looks good with the light grey too. Have you tested colourfastness? I just missed a few weeks of heatwave to do some solar dyeing – how slack is that!!! Maybe you had other things to do with the sunshine, Put! Oh well. Forgetfulness is a bit different. That makes me feel daft too. The grey seems to go well with everything! I haven’t tested, only relied on others who say it’s fast with alum. So far so good, as these are not my first efforts. Thank you! 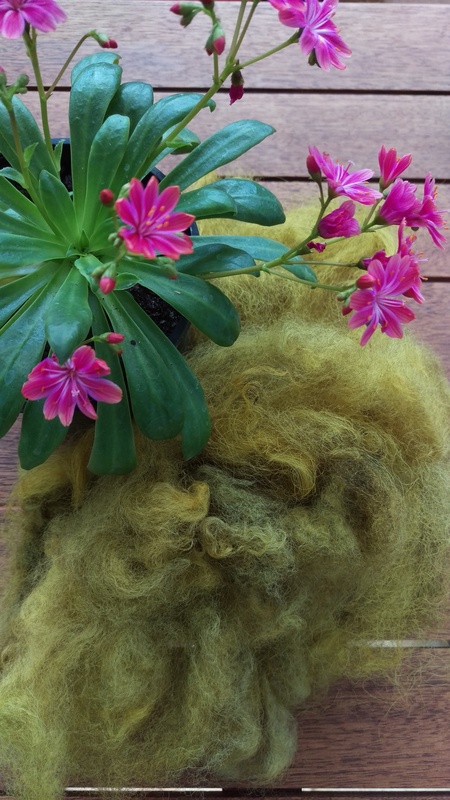 Others have told me that carrot tops give good green but I’ve always failed….now I know about alum!! I haven’t got green from them. Only a greenish shade of yellow. Perhaps iron or copper pots would nudge it into green? 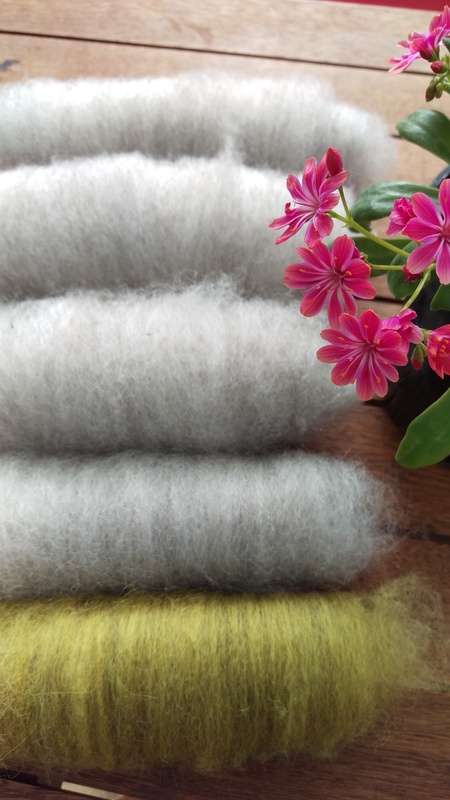 Yellow on grey or -ish wool will also look greener than the same dye on pure white. Love the colour; will try out carrot tops next time I get some. I usually give them to the hens but I don’t remember them ever eating all of them. There should be enough to share…. My hens have no interest in carrot tops so I have no reservations about using them myself 🙂 I am sure they will get some should they ever feel nothing better is on offer! The chooks will now have some competition for the carrot tops. I had no idea you could get such a good colour from them. BTW what is the pink flowering plant in the photo? Don’t forget if you haven’t got carrot tops you can harvest a bit of Queen Anne’s lace (in the carrot family) from the ditches to get that yellow also. Thank you! I have heard this, but it doesn’t grow anywhere near my place. I guess it is just too dry here. i do believe it was carrot tops that sucked me into this wonderful natural dyeing world ! Truly? What a happy thing to happen from such a humble substance… Loved the photos of you at open studio recently Wendi!